Looking for non-locking iPad enclosures for hands-free home use? Non-locking stands are available in many styles! These mounts without locks for tablets, iPad enclosures are ideal for residential use where device security may not be a top concern. Businesses and organizations may also choose to use stands without a lock, and these styles will fit into any décor, whether residential, commercial, or institutional. 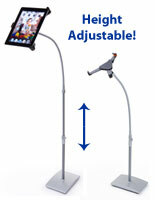 These iPad enclosures, also known as freestanding Apple® tablet kiosks, offer viewing flexibility in any environment. A variety of finishes and materials are available for these versatile stands as well. Adjustable-height iPad enclosures such as these are an affordable alternative to buying separate desktop and floor mounts. Accessories for handheld devices can be used in a number of ways. These iPad enclosures for home use have as many uses as there are apps! What are some of the available styles of free-standing iPad enclosures? Gooseneck: Named after the long, flexible necks of the barnyard fowl, "goosenecks" are generally constructed of spring steel tubing. Spring steel is coiled to create a single strong yet supple pole that stays in place when bent and yet is easily repositioned when needed. Steel goosenecks are lightweight and easy for anyone to bend, and require no special tools for assembly or adjusting. Telescoping: Telescoping poles (sometimes called extendable or retractable poles) are two-piece constructions, generally of aluminum or steel, that are joined together to create a single unit of variable length. These poles create stands and kiosks that can be adjusted to different display heights. Mechanisms for fixing the height of these mounts can involve tightening a screw or simply twisting the poles, depending on the construction. Some telescoping poles will lock in place once set, but are easily adjusted to a different height. Holders that have telescoping poles will usually require some assembly before use, although some stands do ship pre-assembled. Pedestal Base: Pedestal bases come in a variety of shapes and sizes, depending on the style of the kiosks. Smaller bases may sometimes be weighted to ensure stability and security, while larger base-styles may not need weighting. Pedestals may be almost any shape, with round or square being the most common. Materials used for pedestal bottoms can either match or complement the pole and enclosure styles. Decorative materials or elements, such as a glass base or metal base with ornamental detailing, are common. 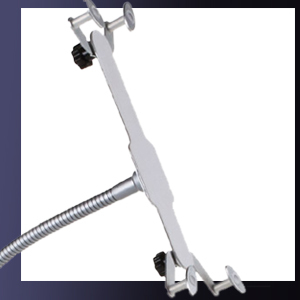 Tripod Foot: Stands with three "feet" are also widely used in freestanding tablet holder manufacture. Foot types can include telescoping pole construction (similar to music stands), solid pole construction (which may include decorative detailing), or decorative feet of metal or other material. Footed kiosks often come with either padding or rubber caps to prevent scratching or other surface damage. Podium Style: Podium or "kiosk-style" enclosures are in general more substantial in construction than tripod or pole configurations. Typically a square-shaped column of either metal or wood, podium-style stands normally offer a support column that is at least the same size, and sometimes larger, than the tablet holder case itself. Freestanding mounts that are suitable for home use (and business use as well, for situations that do not require designed-in device security measures) are manufactured to match many different environments. Common colors used for finishes include black, white, and silver, which coordinate well with any environment. Decorative elements such as colored or shaped bases are also easy to find, as well as different construction materials for both looks and durability. Non-locking displays for tablet-sized computing devices continue to gain in popularity for residential, institutional, and even business use. As more uses are discovered, manufacturers are continuing to create stylish offerings that match or coordinate with more than just "standard" office environments. Decorator choices and elements are becoming more common, as these once-utilitarian mounts gain prominence in homes and dorm rooms. It is not uncommon for a home to contain several handheld encasement styles in different rooms. When device security is not a primary concern, as in home usage, functional but stylish choices are available.